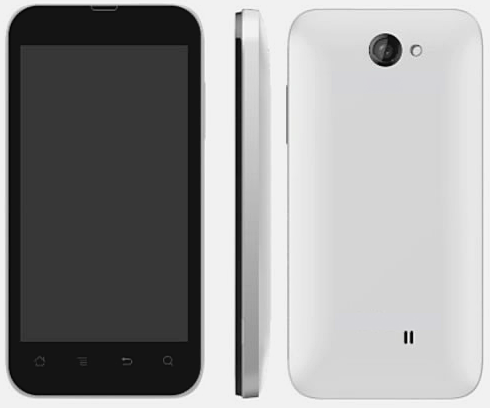 Cherry Mobile Flare Price Php 3,999, Complete Specifications : Cheap Dual SIM Dual Standby Android ICS Smartphone, Out Now! 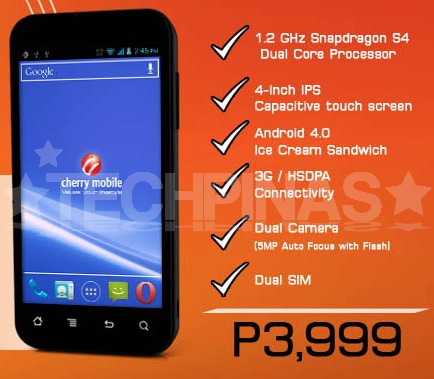 Priced at only Php 3,999, the recently launched Cherry Mobile Flare is easily the most affordable smartphone running Android 4.0 Ice Cream Sandwich operating system that you can get in the Philippine market as of writing. But not only that, I believe it's also the cheapest dual core Android handset currently available. The pocket-friendly device runs on a Snapdragon S4 Play MSM8225 chipset, which contains a 1.2 GHz Dual Core ARM Cortex A5 CPU as well as Adreno 203 graphics chip. Other popular handsets that are powered by this chipset include ZTE Blade 3 and HTC Desire X. Looking at the phone's technical specifications, it's hard to not be impressed at how Cherry Mobile managed to keep its price that low. (Really, I wonder how they do it.) Cherry Mobile Flare flaunts a 4-inch 480 x 800 IPS LCD capacitive touchscreen display and comes replete with 512MB of RAM, 4GB of internal storage that's expandable via microSD card slot, a 5 MegaPixel autofocus camera with LED flash, an HD video recorder, as well as WiFi, Bluetooth, and HSPA+ connectivity support. And on top of all that, it even has Dual SIM Dual Standby capability, which lets you stay connected on two networks at the same time. As I've earlier mentioned, I haven't really got the chance to own a Cherry Mobile phone nor to extensively play with one so I can't really vouch for the quality of the company's products. (Again, if you own a CM handset, let me know your thoughts about your device via our comments section.) I have to admit though that the SRP of this particular release makes it very enticing. Heck, I'm sure it will get the attention of a lot of entry-level consumers who are planning to buy a cheap Android phone this Yuletide. Update as of November 8, 2012: According to some reports from our readers, some Cherry Mobile kiosks are already accepting pre-orders of Cherry Mobile Flare. Units are expected to arrive by the second week of November.